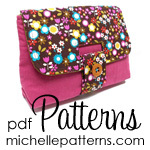 ← Pocketed pillow, mark it with a C! 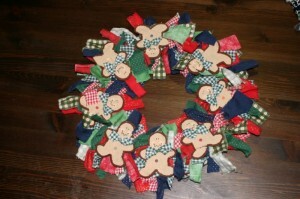 I found this wreath idea in a magazine in *cough* 1999. I went on a binge years ago and made a ton of them and gave them away to people or as Christmas gifts. Now I’ve only got my one banged up one left. I don’t have time to make a new one right now so perhaps next year I’ll make some new little men to replace the ones who have broken in the line of duty. Here’s a bit of a tutorial, what I could throw together without actually making on and taking the pictures. 1. ring of something pretty sturdy, cardboard works, or you can buy the fancy ones from a craft store and sometimes a dollar store. 6. 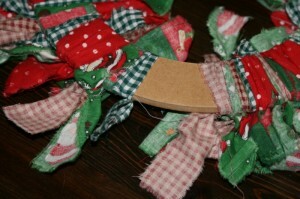 56 scraps of fabric, measuring 1″ x 9″, It’s more rustic looking if you tear the fabric but you can cut it too. 9 1′ x 4″ fabric scraps, cut these ones. 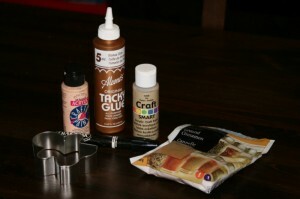 8. some acrylic craft paints, colours can vary but I used a tan, and pinkish colour. A paintbrush and I had a black marker on hand, rather than paints, for details. 1. Mix one cup cinnamon with 4 tablespoons of tacky glue and 3/4 cup water. Mix it around until you have a stiff dough. 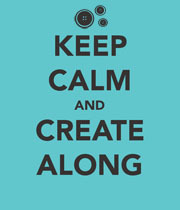 Add more of something to achieve that consistency. Place the dough on the counter and sprinkle with cinnamon so it won’t stick to the roller. Roll dough out to about 1.4″ thickness. 2. 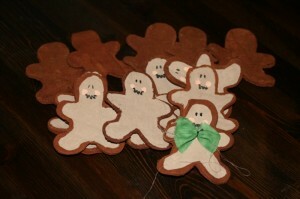 Cut out 9 gingerbread men and transfer them onto the wire rack. Place the wire rack on a cookie sheet and bake at 200 for about 2 1/2 hours. Turn the men over every 20-30 minutes. Your house will smell wonderfully of cinnamon! Leave the cooked men on the rack overnight. They might curl slightly. 3. Paint most of the men with the tan paint, leaving a little bit of the gingerbread edge showing. This may take a few coats to cover the way you like. Add little rosy cheeks and eyes and a mouth. 4. 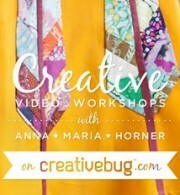 Tie the little 4″ strips into bows and glue gun them to the men to look like little bow ties. 5. Set the men aside and pick up whatever you have for a circle! 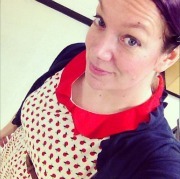 Tie the 1″ x 9″ fabric strips around the circle until it is entirely hidden by fabric. Photo shows the back. 6. Once it’s entirely covered place the ginger men around the wreath with room at the top for your hanging device, be it ribbon or an actual hanger from a door. As I’ve learned, and you can see from a few of my men, they are fragile and can break so store your wreath lovingly. The men also smell like cinnamon for some time, so if you can keep it in some sort of sealed box that will help preserve the smell. What’s more festive than yummy smelling cinnamon! 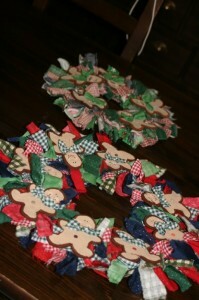 This entry was posted in other crafts, tutorial-ish and tagged christmas, decor, fabric, gingerbread men, holiday, wreath. Bookmark the permalink.